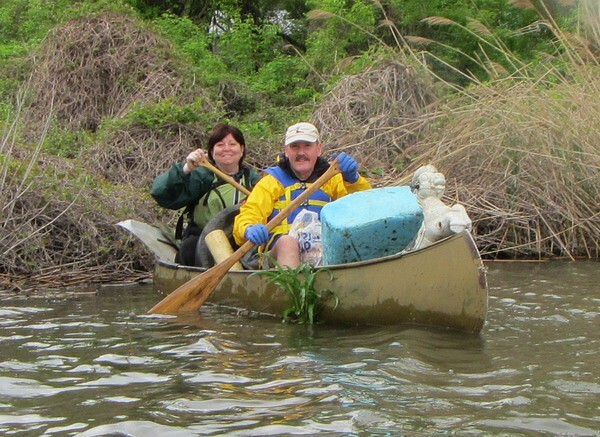 Riverkeeper Sweep at Annsville Creek, via hudsonriverkeeper on Flickr. Although the dangers involved with creek cleanup are usually mild and easily avoided, crews do face some combination of physical, toxic, and natural hazards. After all, we don’t go to the effort of organizing, crowdfunding, and carrying out creek cleanups because our creeks are full of safe, harmless stuff. More often than not, cleaning up a body of water means handling a real mess. Creeks and streams are polluted with anything from common trash to rusty metal to livestock carcasses. Taking some common-sense safety measures will make sure that you protect yourself and your helpers while also protecting the environment. Physical hazards come from things that can cut you, bruise you, or otherwise ding you up. Some physical hazards, like a downed power line or a dam that’s being strained to its limits, need to be dealt with by authorities. Other physical hazards, like rusty sheet metal or a tangle of barbed wire, can be avoided by making sure your team is wearing sturdy footwear, long sleeves, and leather gloves. 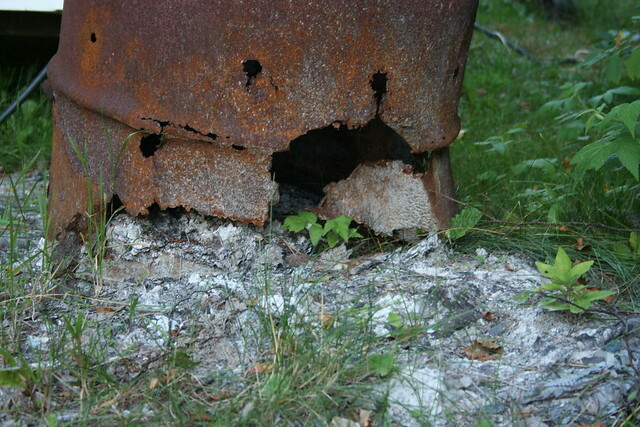 Toxic hazards are things that can make you sick. Although large-scale toxic hazards like industrial spills need to be cleaned up by experienced professionals with hazmat training, most toxic hazards you will find are much less severe. The Seven Islands cleanup in Tennessee is an example of typical toxic hazards that your creek cleanup team might deal with. Those rusty oil barrels carry both the hazard of tetanus and the hazard of coming into contact with whatever the barrels were holding. Fortunately, most common toxic hazards can be avoided by wearing protective gear like thick rubber gloves and thick rubber boots. Angry Moose by Jonathan Morgan. Natural hazards are parts of your creek’s ecosystem that may not be polluted, but still have the potential to hurt you. Swift currents and deep holes can spell disaster for a well-meaning creek cleanup crew; this hazard can be avoided by being aware of your footing at all times and avoiding wading when you cannot see the bottom. Another natural hazard can come from wildlife that doesn’t want to be disturbed. Pay attention to the kinds of critters that can harm you in your creek’s area. From poisonous snakes to territorial moose, being careful and respectful of your surroundings and the animals they harbor is the best way to avoid these hazards. 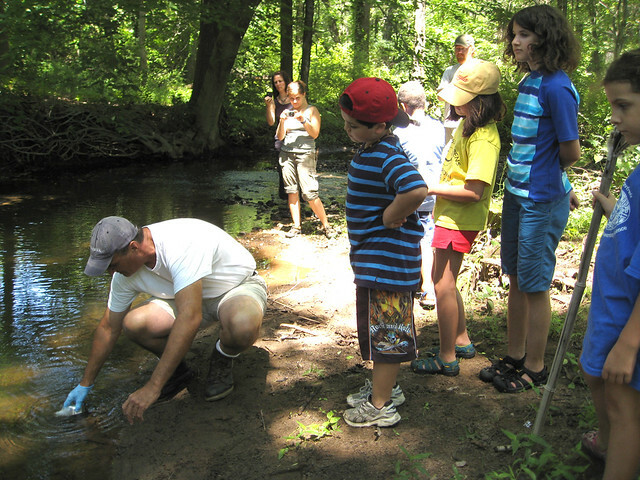 Riverkeeper sampling on Sparkill Creek, via hudsonriverkeeper on Flickr. There’s no reason why you or your crew should be put off from creek cleaning by the hazards involved. After all, your environment and wildlife don’t have the opportunity to put on some gloves and boots when dealing with the pollution in your area’s creeks. Following these simple safety tips can help you make sure that you and your environment stay safe from physical hazards, toxic hazards, and natural hazards.